Rewatchable Signage at Boston’s Outside the Box Festival | Rewatchable, Inc.
We got to partner with our good friends over at 92.5 The River to produce sponsor animations and motion graphics for the big screens at this weekend’s Buffalo Tom, Lemonheads, and Mighty Mighty Bosstones concert on Boston Common as part of the Outside the Box Performing Arts Festival! 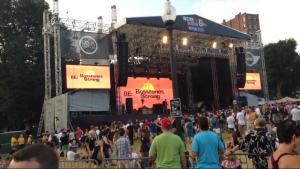 Here’s an action shot of one of the screens just before the Bosstones took to the stage. It was a great event, and a great show for a great city. Thanks to Pete for grabbing the action shot!